Great Dane Temperament (Gentle, Loving): Intimidating But All Heart! 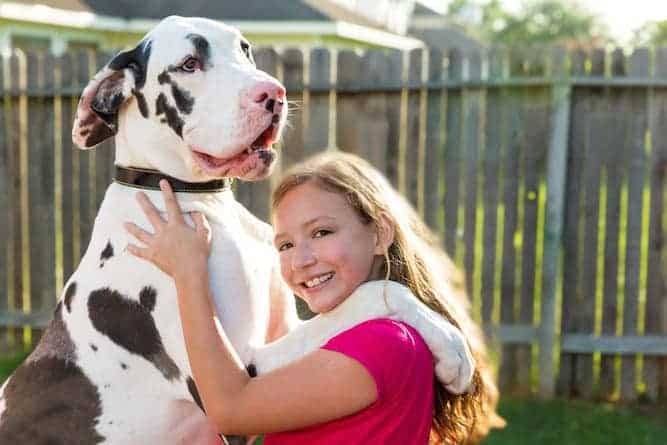 You might feel intimidated at first by their size, but the Great Dane temperament is the very definition of a gentle giant. He’s large enough to scare away unwanted guests but docile enough to make for the best companion your family has ever known. The Great Dane’s history as we know it today confirms that he is not actually a Danish breed. Breeders developed the Great Dane in Germany by combining the Irish Wolfhound with the English Mastiff. Hunters used Great Danes to chase and catch Wild Boars. They were also effective guard dogs who would protect their owner’s house and land. The Great Dane temperament is that of a strong-willed working dog, a powerful hunter and a protector, and he has deeply entrenched territorial instincts. Because hunters trained his ancestors to hunt alongside them, the Great Dane is instinctually devoted to his human family. He doesn't enjoy being on his own – in fact, he can become quite stressed when his companions aren’t around. 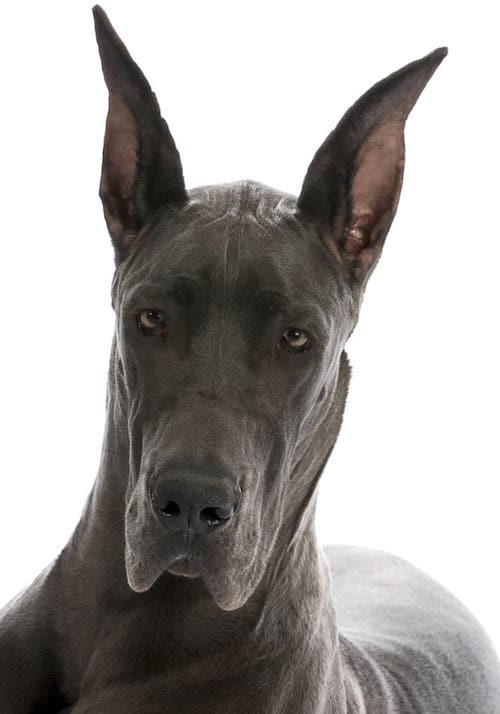 Without the proper training, it is more likely that you will have a more reserved Great Dane temperament. However, the more he learns that people he doesn’t know can still be good people, the more likely he will open up to them and be less suspicious. The confident Great Dane temperament is an earned temperament. He’s not always so confident right out of the box without the proper training. The Great Dane’s intelligence helps him to separate friend from foe. This not only increases his confidence but also improves the Great Dane’s temperament with strangers overall. Watch an Intelligent Great Dane drinking from a water cooler…how cool? 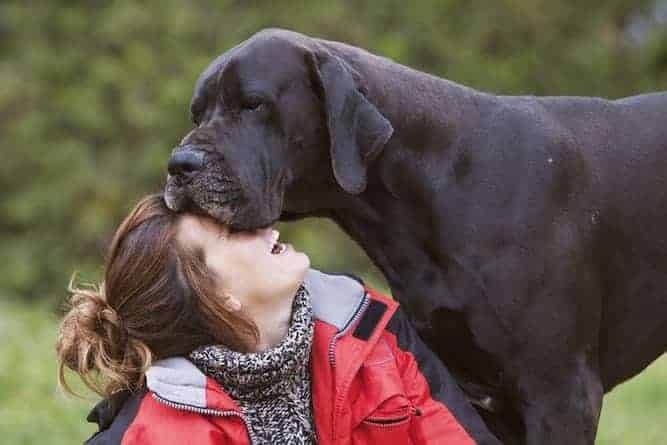 The loving Great Dane temperament is unexpected when you see how big he is. But he really does have a heart of gold. Many people feel terrified of Great Danes because of their size. So, the friendly Great Dane temperament comes as a surprise to many people. In fact, there’s actually something called the Service Dog Project, where Great Dane service dogs help people who struggle with mobility. The gentle Great Dane temperament comes as a surprise to many people. 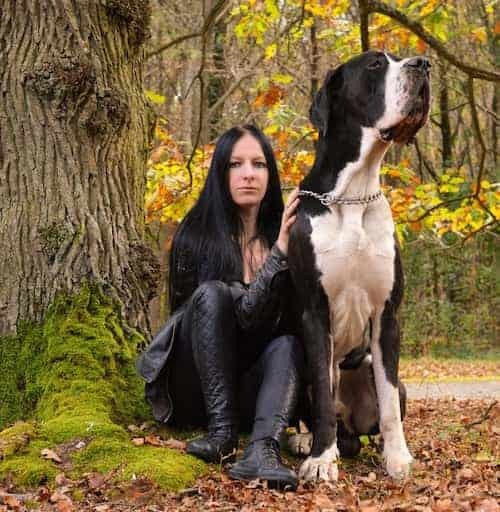 I have found that in all my dealings with Great Danes, their temperament has consistently been that of a gentle, easygoing giant. Great Danes aren't usually aggressive, but their size and deep, resonant bark is enough to put off any unwelcome visitors to my home. This makes a Great Dane guard dog a wonderful security option. Challenges/Disadvantages To Owning a Great Dane. For one thing, they take up a lot of space, and their food bill can eat up (no pun intended) a big chunk of your family’s budget. You will always need a have a hand towel nearby to wipe up the excessive amount of drool he produces. 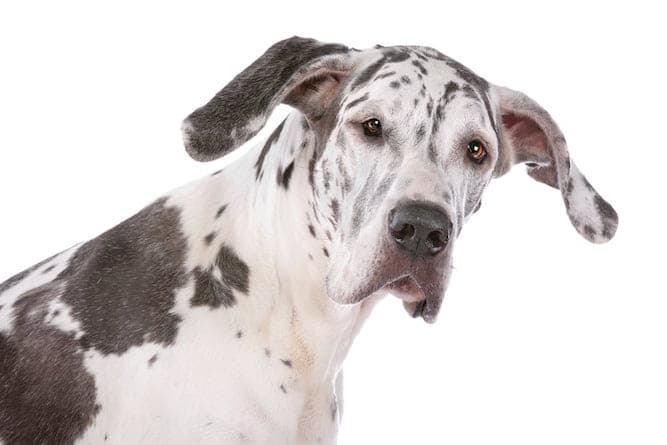 As far as the Great Dane’s temperament with children goes, the dog’s size can cause problems. Great Danes can easily knock a young child over and even step on the child without even being aware of it. 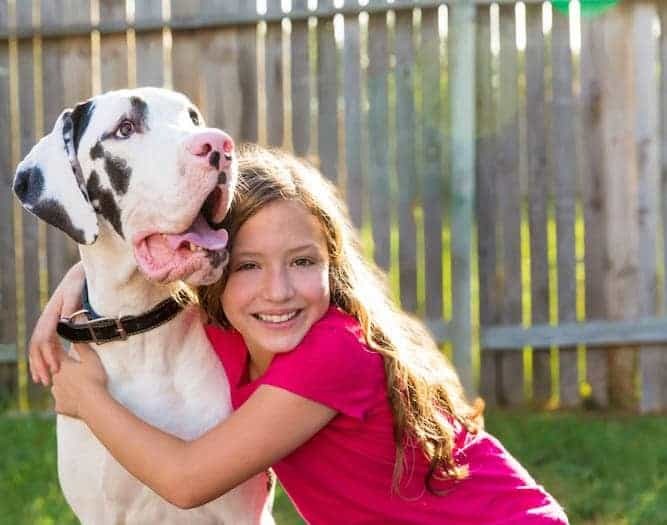 When it comes to the Great Dane’s temperament with kids, these dogs are best suited for households with older children. Not because the dog is mean, but because older children are less likely to suffer an accidental injury from the family dog. The fact that Great Danes are such devoted dogs can become a problem when it leads to separation anxiety. A lonely Dane can become bored and make his own entertainment, which can involve digging, chewing or destroying things around the home and yard. Some Dane lines have aggressive tendencies that can make them dangerous dogs, while other lines are shy, nervous and don't like to meet new people. It all depends on their upbringing and personality. In both circumstances, these lines could be biters – in the first, because they are aggressive and in the second, because they are frightened. The first thing to do to minimize your chances of getting a problem child of a dog is to leave your pup with his litter until he is 8 weeks old to give him the best opportunity to socialize with his canine family. Then, when you finally do bring your pup home, book him into puppy pre-school straightaway, and follow it up with regular obedience classes. Start establishing the rules while your Dane is still small and reinforce them regularly. These dogs can grow up to 150 lbs. as adults. Your cute Great Dane puppy jumping up for a cuddle won't be so cute anymore when he’s almost bigger than you are! Socialization is a must to produce an even dog temperament. This is even truer if your dog has aggressive behaviors or nervous tendencies. Take your Great Dane out to meet friendly people and experience different environments while he is still young. This will help him develop the confidence he needs as an adult and will help him learn to adapt to changing circumstances. This applies to the Great Dane’s temperament with other dogs as well. However, you must monitor the Great Dane’s temperament with small dogs. He tends to view others to be equal to him, and he may play too roughly, thinking the dog is similar in size to himself. As for the Great Dane’s temperament with cats, he has a high prey drive. This means that he thinks animals smaller than him are prey, and he will give chase. Another important aspect of managing your Great Dane's temperament is to get him used to being on his own from a young age. This reduces the risk of his developing anxiety-related behaviors when you aren't with him. Alternatively, you can consider getting him a canine companion to keep him company. Just be sure that you and your family are ready for the responsibilities that come along with taking care of two dogs instead of one. As far as male vs. female Great Dane temperament is concerned, it really boils down to the individual dog. Gender doesn’t matter so much as how trained the dog is, and what his (or her) natural tendencies are. To reduce the behavioral problems associated with the Great Dane temperament, you need to start training him early. Training is perhaps even more important with a Great Dane because of his large size. If he doesn’t learn to not jump on people, for example, he can actually hurt them. This is much different than if a small dog, like a Shih Tzu, were to jump up on people. If you find your training methods aren’t working, then you absolutely need to enroll him in obedience classes. Socialize him well and be consistent, and he will learn all he needs to know to be a confident and well-mannered dog. For the Great Dane, shedding isn’t too big of an issue. However, because he is so large, even though he doesn’t shed a lot, it still amounts to more than you might expect. Brush him weekly to keep the shedding mess to a minimum. He goes through a shedding season once or twice a year, so you’ll need to brush him a bit more during those times. Bathe him occasionally, like when he gets into something stinky or messy that he shouldn’t have. As for colors, there are several colors the Great Dane comes in. There’s even a spotted Great Dane, who looks like a large Dalmatian! This is a harlequin Great Dane. Harlequin is a special kind of pattern, so of course there is no “harlequin Great Dane temperament.” A dog’s color certainly doesn’t determine his behavior! Other Great Dane colors include black, brindle, fawn, blue, and mantle. You may be surprised to learn that for such a large dog, a Great Dane is not very demanding when it comes to exercise. A regular daily walk two or three times a day is enough, same as other breeds. Click here to learn Why Daily Exercises are important. You can take him with you for a jog or a hike, but you must wait until he’s two years old to prevent damaging his growing joints. You should also avoid exercising him around meal times to prevent bloat. And no matter what, keep him on a leash. His strong prey drive can cause him to follow his nose, and before you know it, you’ve lost your dog. 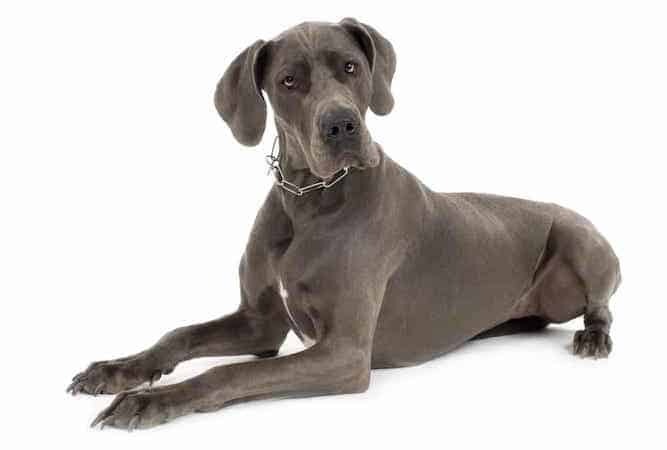 Most Great Danes are healthy dogs, but you still need to be aware of the health issues that can affect them. The average Great Dane height is between 28 and 32 inches for a female, and between 30 and 34 inches for a male. That’s huge! The Great Dane’s life expectancy is between 8 and 10 years. Note: Our Health is #1 Priority. It should be no different for your Great Dane. But you need to help him. The Ultimate Guide to Dog Health is the answer. This handy guide will help you recognize the symptoms of the health problems above. Get the knowledge to stay ahead of these terrible issues that can rob your Great Dane from vigor and life. Help your friend make it to 10yrs+ without pain and suffering. Does the Great Dane sound like the kind of dog you’d like to add to your family? Wonderful! You can find a Great Dane for sale either from a breeder who specializes in Great Danes, or through your local animal shelter. The average Great Dane price is around $600. Some Great Dane puppies can cost as much as $3,000, though! The Great Dane dog price may seem a little steep, but it all depends on who you get your dog from. The average Great Dane cost can vary based on things like the breeder’s location and the lineage of the dog. If you want to adopt a Great Dane puppy, you may be able to find one at your local animal shelters. 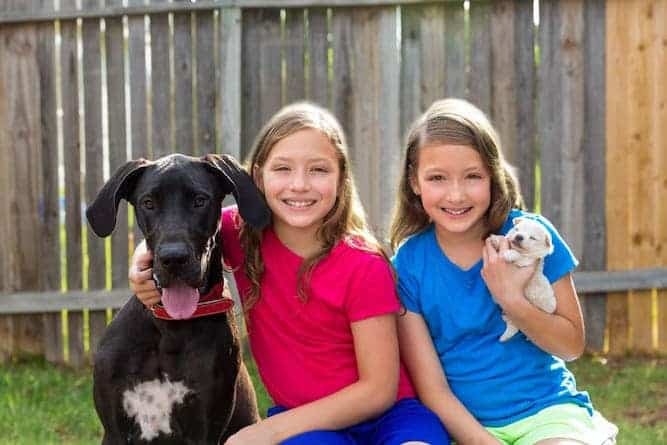 A Great Dane rescue is a good idea if you’re on a budget, or if you just don’t have the patience to train a puppy from the start. Normally, rescue dogs receive training at the shelter, if their former owners did not train them already. A shelter is also a great place to get a mixed breed, like the Great Dane Mastiff, or “Daniff.” This is because people tend to give dogs up for adoption that aren’t purebreds. Choose your Great Dane's breeder carefully. A responsible breeder only mates dogs with the best temperaments, so their pups are likely to be similarly good-natured. 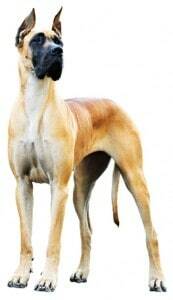 The Great Dane Club of America is a good place to start if you’re looking for a breeder. Here, you will find a list of breeders who actually breed their dogs for health and longevity. This is what you want in every breeder, but it is especially important for the larger Great Dane. The Great Dane belongs to the group of dogs known as the Working Dogs group. Working dogs are stronger and larger than other breeds, and they do best with tasks involving rescuing, pulling, and guarding. They are also, on average, smarter and more resourceful. They are fast learners, and they make great companions. Conclusion: Why the Great Dane? If you have the space in your home for one, the Great Dane temperament makes him a wonderful family dog. Friendly and affectionate, yet protective if the need arises, the many aspects of the Great Dane will make your everyday life a lot more enjoyable.